I have some frozen durian pulps sitting in my freezer. It's about time to use them up. So here you go, durian puffs. My whole house smell of durian now. When eaten cold, this is a really yummy dessert. As the durian itself is already sweet, I did not add any sugar at all for this puffs. 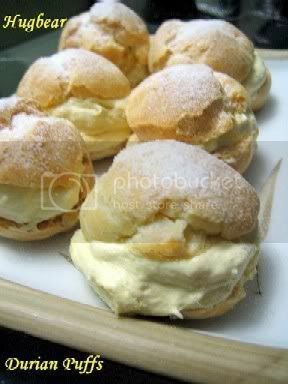 For the choux pastry, please refer to my cream puff recipe here. For the durian fillings, this is my own trial and error recipe. Whip up whipping cream to a soft peak. Add in durian pulps and melted gelatine powder and mix well. Put fillings in a piping bag and pipe it out into the baked choux pastry. If you like, you can just spoon the fillings into the pastry too. Dust the top of the pastry with some snow powder and leave it in fridge to chill before serving. See more information on Travel Technology here. Yummy durian puffs! Lee, you re so generous with your fillings! Jestina, ya, homemade is always the best, can stuff more filling. diddy, eating durian is an acquired taste. It's either you like it or you hate it. For many locals here in Singapore, we love it. My Filipina domestic helper doesn't hate it but doesn't like it either. LOL Her comment was, durian's taste and smell is too strong for her to handle. aw! i see durian OOZING out! Wow Lee Lee, the durian puffs looked yummy. Great job dearie! Wooooooo, Lee Lee, the durian puffs look like store-bot, very inviting, esp wif the durian oozing out!! One of these days, I'm gonna bake some (recipe fm Judy, Creative), but dun noe wen, hmmmmmm??? Keep the good bakes/food coming, u r such a capable girl, well done, *thumbs thumbs up*!! Dun now leh cos din try yet n I've learned this donkey years. Got thousands of recipes and many many cookbooks but only attempted some.Recently, kept on buying y3k books and also my sis in UK gave me abt 6 books on cupcakes and 1 on "The best 50 cheesecakes in the world", but haven't the inclination to try anything yet. If u r interested in the recipe, I can email u.
Hve not tried Judy's recipe so dun really know but fm all the classes that I've attended, generally her recipes are ok. Some of them have to be improvised tho. Understand u're the expert in fondant!! Went to Chong Tdg n saw the fondant but din buy cos dun noe how to handle...mayb next time u can teach me. BTW, if u're interested in comparing Judy's recipe, I can email to u.
Hi k, thanks for your offer. The recipes you talked abt in your recent acquired cookbooks sound interesting. If you don't mind, can you email them to me at leeleet@gmail.com. Thanks a million. Lee, I am hungry by looking at your puffs! Hi Diana, thanks for dropping by. No bakes from you since the holiday is here? OMG! i been wanting to learn how to make durian puff and so glad you show it!!!! i hope to make some when i get hold of the durians... by the way,is it possible to use dairy whipping cream to the durian filling? is gelantine leaf instead of powder able to do the trick as well? i wonder where to get the non-dairy whipping cream other than phoon huat? so sorry i got many questions! heheehe ..hope can hear from you sooN! Hi Dls, it is possible to use diary whipping cream but I would suggest using non-diary as it will not be to overly rich. You can also use gelatine leaf but I am not sure how much you need to use though. You can get Pour n Whip from Cold Storage or Sun Lik if you need some non-diary whipping cream. 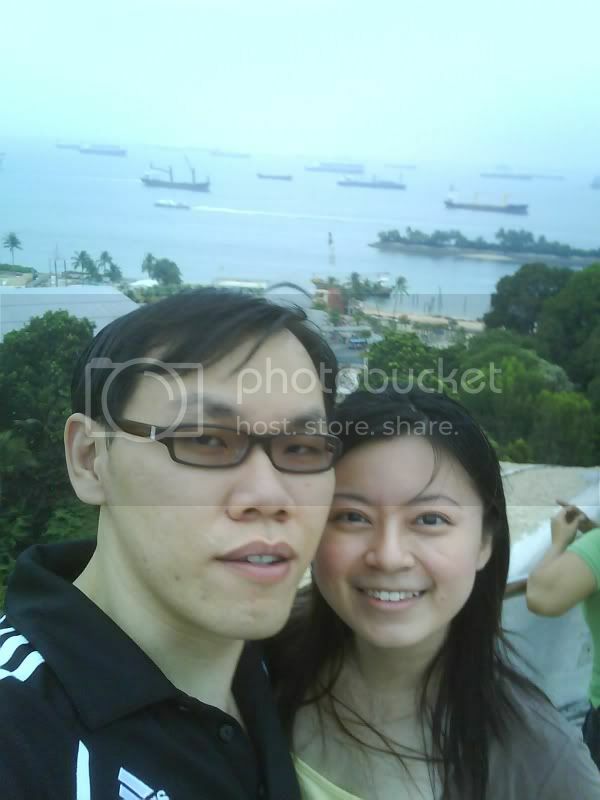 hi.. this is my first time viewing your blog.. i love it lots!! especially the photos.. i gonna try the durian puffs soon! Anyway how long can i store the durian puffs? or do i need to consume within a day? Hi Babygirl, keep the durian puffs in the freezer and it can be stored for up to two weeks. If it's in the normal fridge compartment, then try to consume it within 3 to 4 days. Hi Hugbear.. I have tried to make your durian puffs as well as the mango pudding.. Its was great! My family loves it too. Really thanks for your recipe. Hmmm.. when i free i sure go try out more of your recipe.. They looks delicious! haha..
Erm.. gonna ask you about the sugar paste.. What is "WILTON" colour paste? Where can i get it? At Phoon Huat? Looking forward to your reply..
whao! your durian puffs look so good! btw, i have durain puree in the freezer is it the same as durian pulps? The durian pulps is just durian flesh. I did not puree it as I want to be able to eat the whole chunk of durian flesh. So if you have durian puree and it is not too watery, you can use it too. Hi, it is great to have found u blog today. Can i know whether i can o,it the gelatine when i make the durian pulps with whip cream? I used your recipe over the weekend and the puffs came out GREAT! Family loved it and asked me to make more! Thanks for sharing the recipe. I also used 200ml non-diary whipped cream + 2 tbsp cocoa powder and whipped them to use as filling, as my girl doesn't like durian. Tasted very good too. Hi, thanks for posting this recipe! I can't seem to find any gelatine powder in the supermarkets around my house. Can I substitute it with agar-agar powder instead? Actually I am not too sure if you can use agar agar powder instead. It is easier to melt gelatine with some hot water then agar agar powder though. Most shops that sell bakery stuff should have gelatine powder. Finally get to try this recipe. My son, though not a durian eater, ate 2 pcs of the puffs. My inlaws like too. Thanks for sharing. Khim, I just thaw it. I make the durain puff on a sun, Hwowever, the durain turned sourish by tues. I keep them well in fridge. Cld it be the gelatine tat caused the change of taste in durain puree? Need Malaysian Durian flesh just mail me at leongks52@gmail.com. We supply durian in frozen year long for Malaysia & Singapore.